On 29 April 1882 Werner von Siemens demonstrated a horse-drawn carriage equipped with an electrical engine taking power from an overhead wire in Halensee near Berlin. This electric powered horse-drawn carriage was named Elektromote. This vehicle operated on a 540 m long test road. The test road with cobblestone pavement was on the road no. 5, today Joachim-Friedrich-Straße, and on the road no.13, today Johann-Georg-Straße. The current was taken from the two-pole overhead line by a eight-wheel contact car, which drove on the wires of the overhead line. A flexible cable pulled the contact car towards. 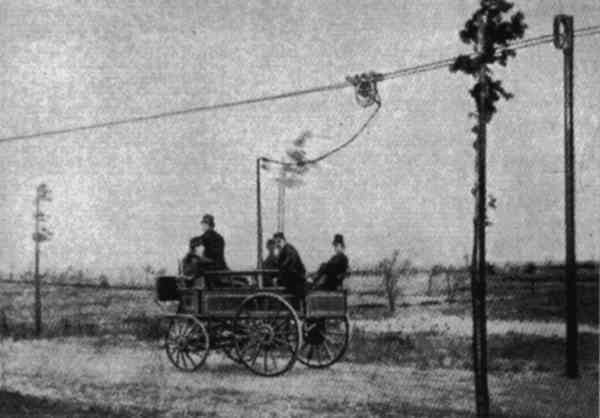 The flexible cable applied to a timber mast installed on the coach and supplied two electric motors each of 2.2 KW of performance with 550V direct current. The two electric motors propelled the rear wheels over a chain drive. Already after six weeks the pilot plant was adjusted. The test road was stooped again on June, 20th 1882. The test vehicle was indicated already all features of the trolleybus and was thus the first trolleybus in the world.